Mightybytes announces a new blog series about sustainable web design, which will help you create a greener, cleaner web. Online video sites like YouTube generate at least 8,000 tons of carbon dioxide (C02) per day. That much C02 would cover the entire Chicagoland area. Data servers will generate about as much carbon as the aviation industry within a few years. Web designers are responsible for climate change. So what can those of us who create the web do to decrease its sizable carbon impact? 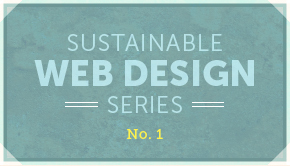 The answer is three simple words: sustainable web design. Sustainable web design principles are based on standard environmental conservation principles, but they can be applied to the life cycle of a website or any type of online media. These principles maximize the efficiency of the web applications and media we create, lightening its carbon footprint and decreasing toxic downstream effects. Sustainable web design principles generally focus on reducing electricity use but also cover the use of ‘green’ ingredients, such as clean energy-powered web hosting, for example. While the average web page uses just 20 milligrams of C02 per second (approximately the size of a small pill) on a desktop machine or about 300 mg for pages that use a lot of animation and video, if you multiply that by the billions and billions of pages viewed every day . . . well, you get the picture. Sustainable web design principles attempt to address how we change this. As an Illinois B Corp, sustainable web design is a natural extension of Mightybytes’ already sustainable business model. We have a sustainable office. Why wouldn’t we build sustainable websites too? The good news for us is that many of the tenets of sustainable web design are based on web standards—something we know a thing or two about—and as such are already built into our existing process. As with most sustainable endeavors, however, there is always room for improvement, which is one of the reasons we decided to launch this blog series. As we educate ourselves, so too do we educate our community. Throughout 2013 we will publish a regular series of posts to our blog (this being the first one) about all the components of sustainable web design. We will consider the topic from many angles, including design, development and content strategy. We will talk about what you can do as a consumer to reduce your personal impact, and present thought leadership on the more technical aspects of sustainable web design. While this discipline is still in its infancy, it is a topic that becomes increasingly important to discuss, as we continue to see the dire effects of climate change, and as our collective appetite for all things digital grows and grows. Many businesses (like all certified B Corps, for example) assess sustainability levels for their office space and the equipment that they use, but very rarely do they assess the carbon footprint of their online properties such as websites and videos. These online properties grow and GROW as companies produce more and more content, and enjoy more and more affordable web hosting costs. Our goal is to help people understand and change how websites, digital apps and online media solutions are built to be as efficient as possible, while still meeting your business goals. Performance optimization – getting sites and digital apps to run more efficiently. Findability – getting content found more easily. User experience, visual design and content strategy – streamlining task flows and creating simple yet delightful interfaces and content campaigns. These categories will change and evolve as we continue to research and write about this topic. How sustainable is your website? Have Ecograder give you the answer.